It seems like every trip we’ve taken with our kids, someone ended up sick and I was grossly unprepared. Even when we went to LEGOLAND, Mr. Yoder was heading out bright and early to CVS to grab cough syrup and cough drops. In the USA, we know what medicines to grab and where to find them. 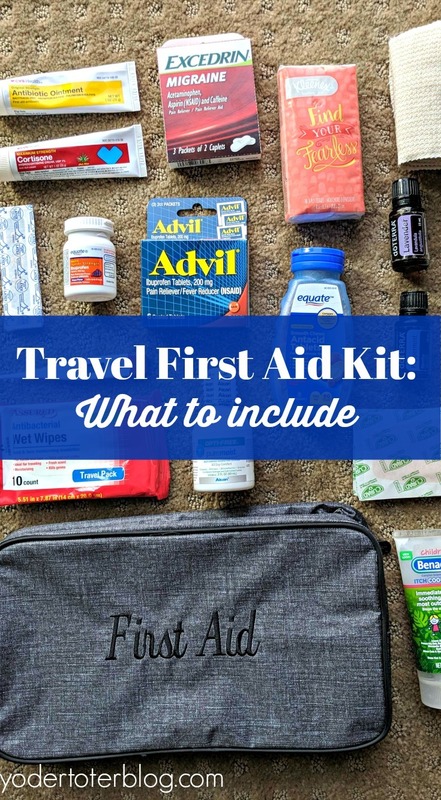 However, when embarking on international travel, it’s a little more concerning as to where we would go and what pills we’d buy in case of emergency. 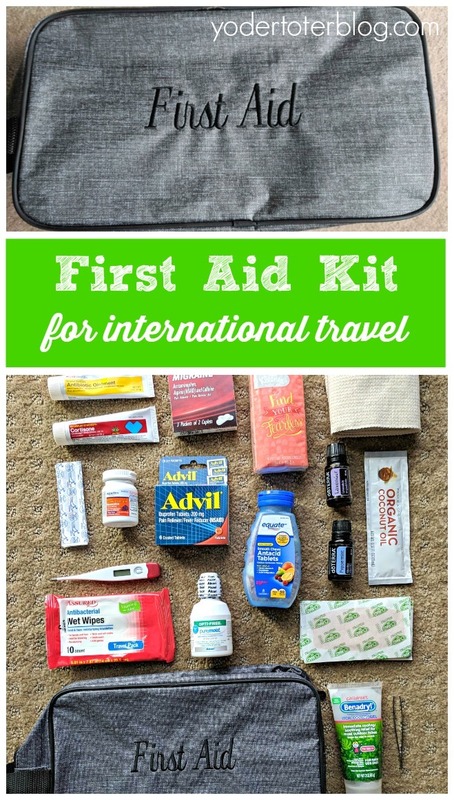 That’s why it was so important for me to pack a first aid kit for our trip to Ireland. Having this bag of medicine and bandages gave me peace of mind. Bag – We used the 24/7 Case from Thirty-One. 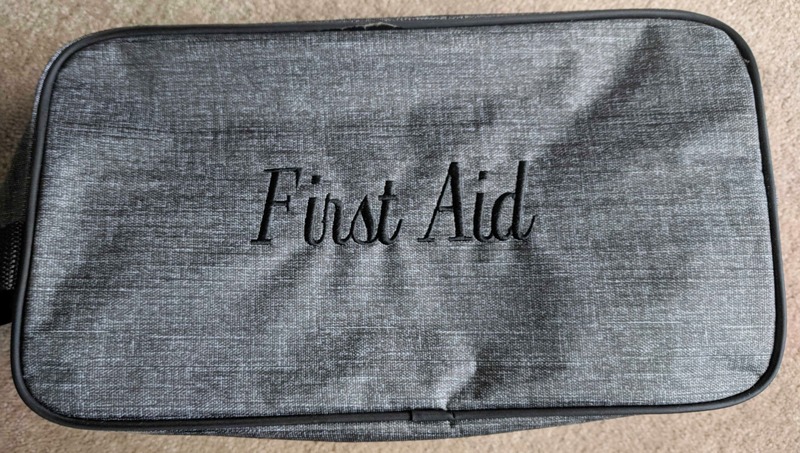 This bag is perfect for cosmetics or supplies, but I found it large enough to hold all of our first aid needs and still fit some of our travel toiletries. Antibiotic Ointment (similar) – perfect for treating cuts and scrapes and keeping them from getting infected. Kleenex travel pack – Dry air on planes can lead to irritated sinuses. Pack a few of these! Ace bandage – Either someone steps off a curb and tweaks an ankle, or jumps off a bunk bed ladder (like my son). These are handy to have around. Essential Oils- I keep lavender on hand for relaxing everyone on an overnight flight or for sunburn/wound care. Peppermint is helpful for settling upset stomachs from car/plane sickness. Coconut Oil (similar) – When using essential oils on children, you need a carrier oil. I love these travel packs. Antacid tablets – Heartburn from too much rich food? Yeah. Children’s Ibuprofen (similar) – For managing children’s pain. Antibacterial Wipes (similar) – I love to wipe down the trays on the planes before my kids eat from them! Children’s Benadryl Gel – This is my go-to for bug bites that get a little too itchy for little ones. Tweezers (similar) – Because we’ve had a splinter crisis while hiking. You never know. You can tweak this list to the destination that you chose. I think the important part, especially when traveling with a family, is that you are prepared for minor health issues. Having a few items on hand will allow you to save time and money (and translation issues) when issues arise.